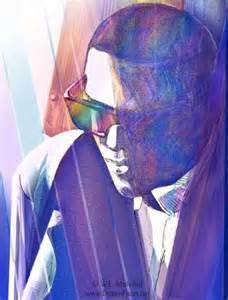 This post serves as an index to all the items about Ray Charles on this site, especially the VIDEO SERIES “Me and Brother Ray” (see below). I have been a professor of English for several decades now, so it may seem strange to say that an American jazz-blues-pop-and-rock-and-roll-singer has been the one who has influenced my career the most. He has. As a kid, just as I hit double-digit age, I discovered jazz and blues through Charles, which led me into issues of race, something that had already begun troubling me. My first book, Voices and Freedoms, was a history of jazz published during the nation’s Bicentennial and made into a 16-part radio series that played across the U.S. for five years. Its specific take on the music included a lot about race, something I’m still proud of. I started violin lessons at six, and though I eventually became good enough to become the concert meister of the Monterey Civic Youth Orchestra, music never made deep down sense to me until I heard Ray Charles’ “Georgia on My Mind.” I had a jazz trio in my teens. 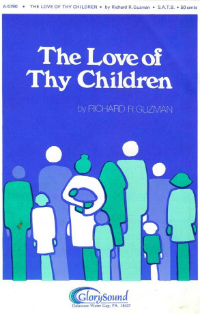 I’ve been a member of ASCAP (the American Society of Composers Authors and Publishers) since at least 1981, mainly on the strength of some compositions (one, “The Love of Thy Children,” pictured at left) which combined traditional white choral styles with gospel, blues, and jazz—my own small attempt to try combinations similar to Ray Charles’. His combinations, of course, changed musical history. Academically, my specialty became black, multicultural, and world literature, and to this day one of my bread-and-butter courses is the graduate course Race, Ethnicity, and the American Experience (see a list of courses and access some course materials Here). One of my most recent books is Black Writing from Chicago. I begin my introduction by referring to Hoyt W. Fuller, who compares the daring of Chicago writing to Ray Charles’ music: more blunt and aggressive, more raw and free-wheeling. Ray Charles led, of course, a painful, tumultuous, often scandalous personal life, but he produced world-changing music, a music laced through and through with a profound combination of pain and joy. I can trace almost all of my professional life back not just to my interest in his music, but the inspiration that music provided. Only the writer James Baldwin comes close to Ray Charles’ influence on me, so there is (or will be) a lot on this site about Brother Ray. ♦ Links to the items below will go live when they become available. The Genius Hits the Road: Escaping the South? This entry was posted in Black Writers, Chicago Writing, Diversity & Multiculturalism, Music & Meaning and tagged Black Writing from Chicago, James Baldwin, Ray Charles, Voices and Freedoms: A History of Jazz. Bookmark the permalink.